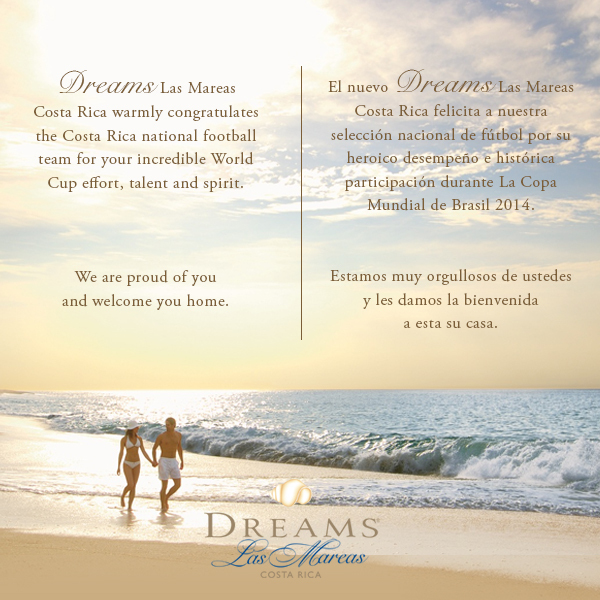 Dreams Las Mareas Welcomes Home the Costa Rica National Football Team! If you don’t already know…Dreams Resorts & Spas is heading to Costa Rica!!! Dreams Las Mareas Costa Rica opens November 1, 2014! There are so many exciting things that Costa Rica has to offer but we wanted to take the time to highlight their most recent success and extend our congratulations to the Costa Rica National Football Team for their tremendous success during the 2014 FIFA World Cup. Welcome Home from Dreams Las Mareas! This entry was posted in Dreams Resorts & Spas and tagged Family Fun, FIFA, Football, Soccer, vacation, World Cup. Bookmark the permalink. Pingback: Dreams Las Mareas Welcomes Home the Costa Rica National Football Team! Estoy muy interesado en asistir a la inauguración y ademas ojala desde ya poder contactarlos para formalizar con ustedes algún contrato ya que tengo varios grupos q quieren conocer el lugar. Por lo cual me urge q alguno de sus representantes se comunique con migo ya sea por correo o por vía telefónica al 00506- 83669751 con Geovanny Chaves. urgente.